We are able to offer our patients the freedom to recover in their own home through our in-house pharmacist when the patient’s physician orders intravenous fluids ranging from hydration, antibiotic, pain management or TPN therapy. See our Full Home Infusion Pharmacy Products and Services here! We strive to make sure you have all of the necessary medications and supplies to ensure continuity of care in your home. We routinely provide all infusion therapy supplies on the date of your discharge from the hospital or as soon as we are provided with a referral or prescription from your physician. Need more information or have questions about home infusion? We are excited to hear about your interest in Health Care Unlimited. Fill out this form and someone will be in touch with you as soon as possible. Thank you for your time! For patients with nutritional deficits, we offer Total Parenteral Nutrition for in-home patients. With TPN infusion therapy, a patient receives a special formulation of protein, carbohydrates, and electrolytes with or without lipids (fats) to provide complete nutrition via the intravenous route. Patients that receive total parenteral nutrition will usually have a “central” line or a catheter inserted in a vein to provide the infusion therapy. Your physician, our clinical pharmacist and your nurse oversee close monitoring of your nutritional status. Intravenous Hydration is used for extreme cases of dehydration. Rehydration is needed when a person becomes extremely dehydrated and requires more electrolytes. In cases where the patient does not respond well to oral rehydration, a physician may order IV rehydration. Dehydration in children and seniors is most common although adults can also become dehydrated due to illness or excessive exercise. 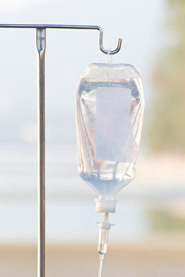 IV Hydration involves injecting fluids consisting of mostly water, some salt and sugar directly into the vein. This is mix is typically delivered in a bag hung above the patient with a tube connected to a port that is inserted directly to the patient’s vein. 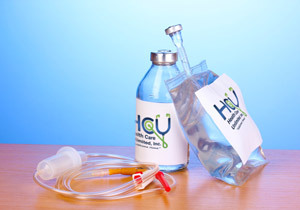 We offer intravenous hydration therapy to patients that may need these infusions to improve their hydration status. When intravenous hydration therapy is ordered, a nurse will administer the infusion through an intravenous catheter. The typical hydration infusions include normal saline or combinations of dextrose and normal saline with or without electrolytes (e.g. Potassium, Magnesium, etc.). We offer intermittent as well as continuous infusion of intravenous antibiotics. The antibiotic infusions we provide are professionally prepared using a laminar flow hood in a special room for compounding medications. Some of the antibiotic infusions we provide are administered to the patient with an infusion pump to regulate the flow of the infusion. In other cases, the antibiotic infusion may simply be administered by gravity if the rate of the infusion does not require careful regulation. A clinical pharmacist and a field nurse monitor all patients on intravenous antibiotic infusions. 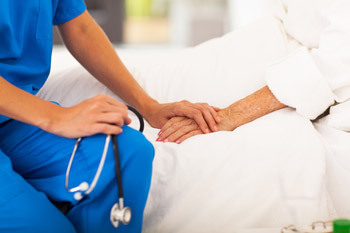 If any problems or complications are encountered with the infusion therapy, your physician is contacted immediately. As part of our monitoring of antibiotic infusions, we have developed standardized protocols for checking blood levels of specific antibiotics that require careful monitoring. Your physician will be notified if blood levels are above or below the therapeutic range. We offer a comprehensive pain management program including the preparation of special intravenous infusions to control severe pain in chronic illnesses as well as acute illnesses. Our professional staff uses a special laminar flow hood in a special room for compounding these types of infusions. We perform regular checks on your pain control and notify your physician if we need to increase or decrease the rate of your infusion based on your response. All pain management infusions are administered through an infusion pump that carefully regulates the flow of medication to ensure accuracy. The infusion pumps we provide to our patients have the ability to be used in several modes, such as Patient-Controlled Analgesia (PCA). With PCA mode, the patient is able to press a special button to administer additional doses of medication when pain is not adequately controlled by the infusion. You and your physician decide on which pain management program will work best for you. Management of your pain is our ultimate goal. All trademarks cited here are the property of their respective owners. Site best viewed in Firefox or Google Chrome. Page Generated in 0.009 seconds.